The following originally appeared on 5/11/09 at Exit 51. That Molly, she doesn’t mess around. Those pickled carrots, they knocked my socks off. First, because they were good. Second, because they were HOT. SFC thought they were just right but they were too spicy for me. So depending on your tolerance, you might want to turn down the heat by reducing the red pepper flakes and maybe not cracking the black pepper corns. Also, Molly’s basic brine is beautifully versatile. After the carrots were safely tucked away in the fridge to do their thing, I cooked up a second batch for some asparagus. Instead of red pepper flakes and thyme, I used fresh dill. A quick taste hints at a slightly sweeter flavor with a more traditional tang. Next time, I will wait and add the dill after the brine is off the heat to prevent some slight dill discoloration. And instead of putting in whole bunches of dill, I will give it a rough chop. Because having a big dill frond cling to your pickled asparagus is not good eating. In case you missed the recipe, here it is. I encourage you to mix things up and use vegetables and herbs and spices that you like. Because, as I said to our guests as we devoured a plate full of pickled carrots and asparagus, this is ridiculously easy. The following originally appeared on 5/13/09 at Exit 51. Advertising executives may want you to believe that eating fresh means patronizing a certain fast food chain. To me, it’s something entirely different. My definition of eating fresh is cutting down, as much as possible, the journey fruits and vegetables take from the grower to my plate. Since I’ve come to peace with the fact that I will never be the house in the neighborhood that has a killer vegetable garden, I am eager to find an alternative. See those beautiful spears of asparagus? That was my first attempt. I should preface all this by saying that there was a distinct lack of fresh vegetables in my house as a child. We ate vegetables, but they came out of either a can or a bag and were destined to be boiled down into unappetizing mush on the stove. Tomatoes were the exception. 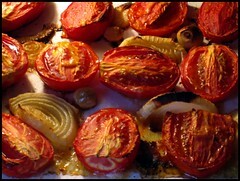 There was always a plate of fresh (from the grocery store) tomatoes in the house. My grandmother would work wonders with even the toughest, driest tomatoes turning them into blt’s or frying them up in her cast iron skillet until the crust was perfectly browned and crisp. Those were some of the best summer breakfasts. 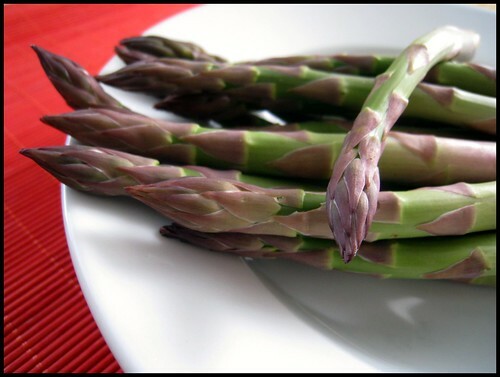 So I grew up thinking that asparagus was mushy and tinny and came with an overabundance of sodium. It has only been as an adult that I’ve discovered the true nature of the spears. And thanks to the folks at the farm stand, I now know what asparagus aspires to be. Having just been picked the day before I bought them, these spears still had life. They were firm and strong, breaking with a clear snap. The tips, usually the first place to show signs of having been sitting around for a while, were tight and unbruised. And the color? It just screamed fresh. Best of all was the taste. The folks at the farm stand, who did the growing, assured me that I would taste a difference. The only word I can come up with to describe what they tasted like is ‘green’. It was like I was tasting Spring. Bright and clean. This is our favorite way to fix asparagus (and string beans). If you don’t have an indoor grill pan, use a large nonstick skillet. This would also work well on a grill. Just be sure to lay the spears perpendicular to the grill grates, skewer them together to make an asparagus raft, or use a grill basket. Lightly oil a nonstick grill pan, using either a silicon basting brush or paper towel to get a thin coat of oil. Preheat pan over medium high flame. Add asparagus and a big pinch of kosher salt. 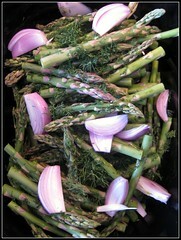 Turn asparagus with tongs as they cook. The color will turn bright green and the spears will begin to soften. Dress with freshly grated lemon zest. The following originally appeared on 5/18/09 at Exit 51. I’m particular about all sorts of things. From the way the dishwasher is loaded to which tshirts get folded and which get hung. Basically, I like things the way I like them. SFC can attest to that. And when I’m forced to make a change, I get all out of sorts. We’ve been in our house for three years and I’m just finally starting to get beyond the fact that my jeans have to be hung instead of being neatly folded and stacked. That’s the downside of living in a small house that lacks closet space. I guess you could say I subscribe to the notion of “if it ain’t broke, don’t fix it”. New Coke? I didn’t believe for one minute that it was just as good as Old Coke. You’d think that the Coke folks would have learned from that fiasco, and yet now they have Coke Zero. Really, what the heck were you thinking? If you have to spend millions of dollars in advertising to get me to believe that Coke Zero tastes the same as regular Coke, then clearly your product isn’t what you claim it is. Move on and take that black labeled abomination with you. I’ll stick to my happy red can, thank you very much. But what about when I love a product and it suddenly disappears? No warning, just gone. I’m talking to you Starbucks. First, you got me hooked on your After Coffee Mints. More powerful than a “curiously strong” Altoid, smaller than a Tic-Tac, it was the perfect mint. Ok sure, you redesigned the container along the way and that didn’t sit too well at first. But I stuck with you. And I even learned to appreciate the beauty of the redesign. No longer would the bottom of my purse be filled with wayward linty mints because the tin opened wide and said “ahhhh”. And it was even easier to get my mint fix while driving because the new tin let me shake them out one or two at a time. No more fumbling around trying to get my fingers in the case and not knock mints in my lap or under the seat. Yes, I came to see the beauty of the redesign. Then you took it away. And what did you give me instead? You gave me this. And you really expect me to believe that these horse pills you call Classic Mints are comparable to my petite After Coffee Mints? As if. First of all, these things are ginormous. After being conditioned to your ACM, this is like shoving a hockey puck in my mouth. Second, they taste nothing alike. The ACM packed a wallop of pure peppermint flavor. The CM? I might as well be sucking on a Starlight Mint. Guess which one lists peppermint oil and menthol as ingredients and which one just says natural and artificial flavors? And by your own Nutrition Facts, 1 of the ACM counts as a serving (with 100 servings to a container) while it takes 3 of the CM (at only 10 servings per container). So you’ve locked me into paying more and getting less. Oh you’re clever all right. But don’t go thinking that I will blindly follow you down this path. You can keep your Classic Mints with its obscenely large tin that spills mints everywhere once you slide the top back. As a point of information, this is not at all user friendly. See, I’ve still got a few of those lovely After Coffee Mint tins. And I think they are the perfect size to hold your competitor’s mini-Altoids. At least those folks know that when something works, if it ain’t broke, don’t fix it. The following originally appeared on 8/26/08 at Exit 51.